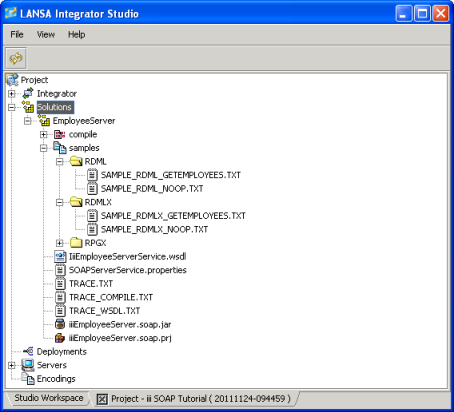 In this step you will build the SOAP Server solution and then review the files that LANSA Integrator has generated. a. Check (i.e. P) the box beside the Operations to be included in the build. In this case, you will tick the box next to the getEmployees Operation. b. Select the Build button on the toolbar to start the build. When the build has completed, this message is displayed. c. Click OK to continue. d. The following window will popup. Click on Cancel. Rather than have Integrator Studio automatically do everything for us, we will go through the manual steps so that you understand exactly what it would have done for you. In subsequent steps if you make any changes you could check all 4 boxes and click OK so that you don't have to perform the manual steps that you are about to perform. 2. Save your new Solution and OK at the confirm dialog. 3. Exit the SOAP Wizard. 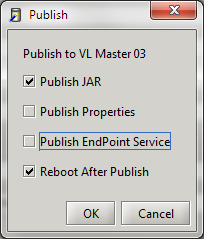 You are returned to the iii SOAP Tutorial Project tab in the LANSA Integrator Studio. 4. Expand the Project's Solutions folder so that you can see the files that LANSA Integrator has generated. This file contains the compiled classes, ready for you to deploy to the server. A project (prj) file, iiiEmployeeServer.soap.prj. If you need to use the SOAP Wizard again to revise what you have done, you will open it using this file (.prj). This file describes this web service in a common XML format which enables any application to use this web service. You will need the file name and path of this file in Step 7. Deploy the SOAP Server Solution. You will deploy this file to the web server in order to fully enable this web service. Other files consisting of some sample generated RDML and RDMLX code for an application that implements this web service and trace and log files.